To enjoy a vacation in the woods thoroughly, it is essential that you have the right kind of tent. The inexperienced are likely to carry too much rather than too little to the woods, to include many unnecessary luxuries and overlook the more practical necessities. However, camp life does not mean that one must be uncomfortable, but rather implies plain and simple living close to nature. An adequate shelter from the sun and rain, a comfortable bed, a good cooking kit, and plenty of wholesome food, are the important things to consider. There are tents and tents, but for average outings in what may be considered a permanent camp, the regulation wall, or army tent is generally used to make a comfortable shelter. It is a splendid utility tent, with floor space and plenty of headroom. 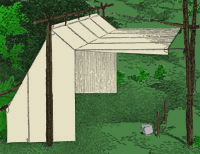 For the permanent camp, the wall tent is often provided with a fly, which may be set up as an extra covering for the roof, or extended over the front to make a kind of porch. An extension may also be purchased to serve the same purpose. The 7 by 9-ft. wall tent will shelter two persons comfortably, but when the camp is seldom moved, the 9 by 12-ft. size, with a 3-1/2ft. wall, will afford more room. The regulation 8-oz. duck is heavy enough, or the same tent may be obtained in tan or dark green khaki, if preferred. In any case the tent should have a sod cloth, from 6 to 12 in. wide, extending around the bottom and sewed to the tent. An extra piece of canvas or floor cloth is desirable, but this as well as the fly are extras, and while convenient, are by no means necessary. The wall tent may be erected with the regular poles, or it may be suspending between two trees. The "Baker" style is a popular tent, giving a large sleeping capacity, yet folding compactly. The 7 by 7-ft. size, with a 8-ft. wall, makes a good comfortable home for two, and will shelter three, or even four, if required. The entire front may be opened to the fire by extending it to form an awning, or it may be thrown back over the ridge to form an open-front lean-to shelter. The "Dan Beard," or camp-fire, tent is a modification of the Baker style, having a slightly steeper pitch, with a smaller front opening. The dimensions are practically the same as the Baker, and it may be pitched by suspending between two trees, by outside poles, or the regular poles may be used. For traveling light by canoe or pack, a somewhat lighter and less bulky form of tent than the above styles may be chosen, and the woodsman is likely to select the forester's or ranger types. The ranger is a half tent with a 2-ft. wall and the entire front is open, in fact, this is the same as the Baker tent without the flap. 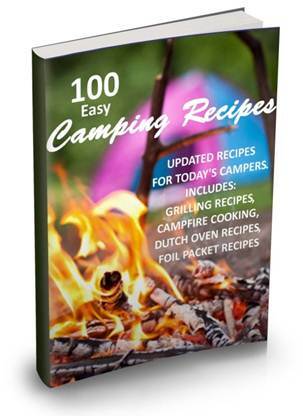 If desired, two half ranger tents with tapes may be purchased and fastened together to form an A, or wedge, tent. This makes a good tent for two on a hike, as each man carries his own half, and is assured a good shelter in case one becomes separated from his companion, and a tight shelter when the two make camp together. The forester's tent is another good one, giving good floor space and folding up very compactly, a 9 by 9-ft. tent weighing about 5-1/2lb. when made of standard-weight fabric. It may be had either with or without hood, and is quickly erected by using three small saplings, one along the ridge, running from peak to ground, and one on each side of the opening, to form a crotch to support the ridge pole, shear-fashion. These tents are not provided with sod or floor cloths, although these may be ordered as extras if wanted. The canoe or "protean" tents are good styles for the camper who travels light and is often on the move. 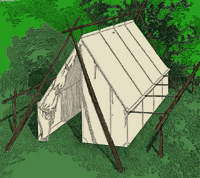 The canoe tent has a circular front, while the protean style is made with a square front, and the wall is attached to the back and along the two sides. Both tents are quickly set up, either with a single inside pole or with two poles set shear-fashion on the outside. A 9 by 9-ft. canoe or protean tent with a 3-ft. wall makes a comfortable home in the open. Whatever style of tent is chosen, it is well to pay a fair price and obtain a good quality of material and workmanship. The cheaper tents are made of heavier material to render them waterproof, while the better grades are fashioned from light-weight fabric of close weave and treated with a water-proofing process. Many of the cheaper tents will give fair service, but the workmanship is often poor, the grommets are apt to pull out, and the seams rip after a little hard use. All tents should be waterproofed, and each pro- vided with a bag in which to pack it. 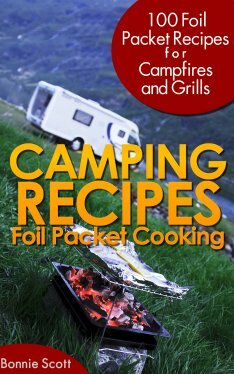 An ordinary tent may be waterproofed in the following manner: Dissolve 1/2lb. of ordinary powdered alum in 4 gallons of hot rain water, and in a separate bucket dissolve 1/2lb. of acetate of lead sugar of lead in 4 gallons of hot rain water. The acetate of lead is poisonous if taken internally. When thoroughly dissolved, let the solutions stand until clear, then pour the alum solution into a tub and add the lead solution. Let the solution stand for an hour or two, then pour off the clear water and thoroughly soak the fabric in the waterproofing mixture by rubbing and working the material with the hands. Hang the cloth up without wringing it out.